The only way to safely view a solar eclipse is with our new and improved Eclipsers™ safe solar glasses. Our eclipse glasses are independently tested and CE certified for the safest direct solar viewing. These eclipse viewing glasses are manufactured exclusively with scratch resistant Black Polymer material and have an optical density of 5 or greater. Our Eclipsers™ filter out 100% of harmful ultra-violet, 100% of harmful infrared, and 99.999% of intense visible light. Our premium filters create the sharpest solar images with a natural orange color. With over 25 MILLION pairs sold, we must be doing something right in the eye of the public. 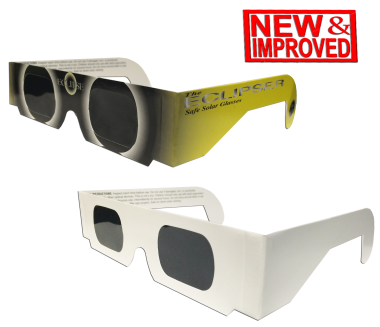 Eclipsers™ are spectacular for sales and premiums at schools, planetariums, science centers, and retailers. For greater advertising impact, let us customize your Eclipsers™ with logos, copy, or messages. Don't be left in the dark without safe solar eclipse glasses-- give us a call or email and we will help you design the best glasses for your specific promotion. 25,000,000 people can’t be wrong! American Paper Optics produced more than 8,000,000 ECLIPSERS for the most-watched eclipses in history, the 1999 European Eclipse, Africa Eclipse 2001, and the Africa/Australia Eclipse in 2002. Millions have been distributed to planetariums, schools, and observatories throughout the United States and Europe. A partial solar eclipse (in the US) will happen on October 23rd, 2014. The Eclipse of 2017 is already on the minds of thousands of people across the U.S. and elsewhere. On that August 21st — a Monday— people will be positioned all along a narrow corridor that stretches from the Pacific to the Atlantic to see a total eclipse of the Sun. It's not too soon to begin to prepare for this once in a lifetime opportunity. Our CE certified Eclipsers™ are independently tested and can be used to safely view the sun during all phases of an eclipse. All of our materials are optical density 5 or greater and are "CE" certified which meets the transmission requirements of scale 12-16 of EN 169/1992. All our eclipse glasses meets the 2012 Transmission Requirements of EN 1836:2005 & AS/NZS 1338.1:1992 for Eclipse filters. The backside of the glasses is pre-printed with safety warnings and instructions for eclipse best practices. Give us a call at 901-381-1515 or email us at sales@3dglassesonline.com and we will help you plan for this once in a lifetime event.